one we missed in earlier dispatches …. Last up for this particular Fruits de Mer soiree, be warned there will be more later this missive, a truly extraordinary listening event. A set of raw unmastered demos, hints of greatness within that were lost and forgotten in the melee of the late 60’s and gathered together and released on limited issue in the early 90’s. enter a group of dudes from Long Beach, who hear the album, fall in love with it no doubt puzzle as to how these nuggets go unheralded while their peers seem obsessed with bands of that era obviously more well known yet sadly lacking in the creativity of their new found find. The band go on to record a covers EP peppered with faithful tastings after which, due to the attracting quiet acclaim, a plan is hatched to rework that much adored demo stuffed CD. 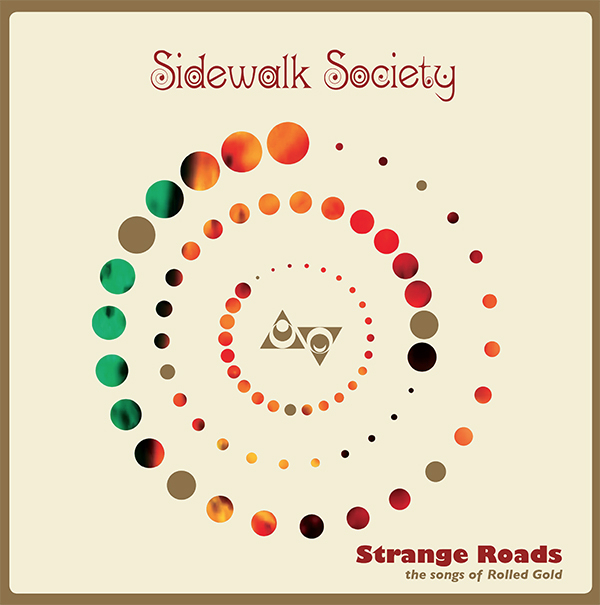 The band from the 60’s are the Action while the band with the burning plan are Sidewalk Society, the album in question ‘rolled gold’, the revisited variant ‘Strange Roads’. Of course they’re not the first band to recreate an album by another, they won’t be the last, but such a process always involves dilemmas, you can always trash it up and stamp a totally different interpretation on matters, you can cut yourself adrift lose your way and make a shambles of it all or, and this is the more difficult option, create a faithful re-reading, which ultimately involves you getting under the skin of the sounds and wiring yourself into not only the authors creative mindset, but the moment, the place and the prevailing vibe and that’s before you’ve gotten around to adapting your style to the point your living, breathing, thinking and playing like your chosen subject. Happily, enough, Sidewalk Society fall into the latter category. Yet what makes this release all the more remarkable and perhaps errs on their side in terms of room to manoeuvre, is the fact that the core material is clean, raw, naked and free from productive processing thus capturing the creative prowess, for want of a better word, naked and free from tinkering and trappings. Sidewalk Society probably wouldn’t thank us for saying this, but they’ve made these 14 cuts their own by rounding out the edges, faithfully adding to and smoothing these iconic recordings, I mean worthy of the admission price alone, ‘something to say’ is finitely cut with the kind of 60’s after glowing power pop precision that nods to the likes of Kevin Tihista and a supporting cast of Autumn Leaves folk. Somewhere else the manic ‘love is all’ arrives aglow in a subtle psych shelling that’s sumptuously refried in Mod-ish wigged out freak outs, in truth not a million miles in style and fashioning as that of a pre ‘SF Sorrow’ era Pretty Things. Creative cool is in abundance on the radiantly lush ‘Icarus’ throughout which classic era Who-isms pour forth while the effervescently fizzed ‘strange roads’ – perhaps all said the best thing here by a short head, is acutely nipped with a needling motif whilst flavoured in a hip wiggling 60’s freak beat dandy grooving. The purring pop symmetry of a first album era Bee Gees are instantly recalled upon hearing the breezily sun toned close harmony hued ‘things you cannot see’ – a wonderfully lazy eyed floral flotilla replete with parping brass posies. Those fancying something a little kissed in a mushrooming kaleidoscopic swirling might do well seeking out ‘I’m a stranger’ which warped with a nifty blues swing that at times veers towards the Faces simultaneously fractures to an olde English eccentricity while the tightly wired and fried ‘follow’ just smokes with a coolly coalesced garage beat grooving. Which leaves ‘in my dreams’ to swoon its way to the end grooves though not before bathing the listening space in a gorgeously psych tweaked dayglo wigginess replete with moments of baroque breathlessness, pulse jangling euphoria and mind expansive lysergics. The happening danders as far as we are concerned. This entry was posted in groovy bastards..., Uncategorized and tagged fruits de mer, sidewalk society. Bookmark the permalink.